Feeling uncertain about what to do is a common part of parenting and it is always worth reminding ourselves of a couple of things. Firstly, our children are people in the same way we are and they learn in the same way we do; by coming up against problems, making mistakes and learning from them. Some of that learning happens quickly and some of it doesn’t. Secondly, it is also worth challenging that feeling of being a failure in ourselves by asking what success is as a parent? It can feel like success is never having problems, but this is just impossible. Success is not the absence of challenges but rather it is the ability to work with what we have and persevere. There is no parent that has all the answers and no perfect child. Children are unique individuals as are we. They gain growth and insight through overcoming things in the same way we do. 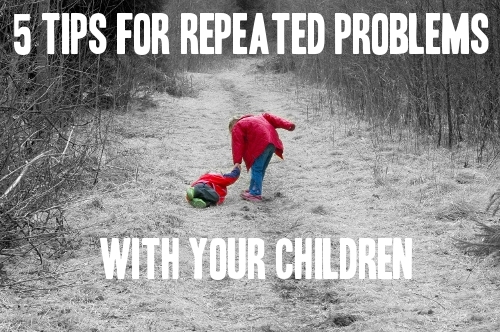 So what to do when there are repeated problems with your children. Well unfortunately there is no magic cure all (as we all know) but there are useful ways to approach the issues. These are my top 5 tips. There is not one approach to dealing with a particular problem because (for recurring issues) it is the emotion or a need behind it that needs to be addressed, which varies from person-to-person. Of course, there are issues that are just pretty straight forward and work on a practical level. A child wetting the bed could just be drinking too much at night so reducing the fluid intake will solve it. But these are not the things that we get stuck on. We get stuck when a child wets the bed because they can’t face bedtime without a comforting drink or because they are wetting the bed through worry. Each requires a different intervention. A child might be getting into trouble because he feels a lack of attention and actually ten minutes of one-to-one time would help that feeling or it may be because he feels frustrated with too much or to little is being asked of him. Here are some useful questions to ask. What might be going on for your child? Is there something behind their behaviour? What feelings or needs do they have right now? Once you have identified this then it is easier to think about some way you could help them. The other important part in the equation is us. We bring as much to the relationship as our children do. Asking ourselves ‘Is this creating fears in me that is more about me than my child?’ is very important. Sometimes we see problems where there is not one. We fear for our child but that fear is ours, not theirs. A good example is the quiet child who always sits on the sidelines at a party until she is ready to join in and play. We might be thinking it is a problem. It may provoke a fear that our child is not socially equipped or that she is being rude. It may remind us of ourselves and feeling left out when we were young. However, our daughter could be perfectly happy watching, taking stock of everything that is going on knowing that when she feels like it she will join in. When we identify how much of the dilemma is our own fears, it helps enormously. There is no point flipping from one approach to another. You won’t know what is working and your child likewise will not know what is going on. Particularly when we are attempting to fill an emotional need we must acknowledge that it takes time. A resentful child who keeps being aggressive to his sibling is unlikely to stop that in two days no matter what approach you take. However, in two weeks it could be a different story as he starts to learn that he has time when he is in charge, for example. All children are on a learning curve, as are we, they just have more to learn about the way the world works. They have the ability to handle life with support and direction. Sometimes you might just need to support them through a situation maybe explaining their emotions as they go so they get to understand what is going on. Sometimes we just have to trust (particularly as they get older) that they have the ability to learn. Stepping in is not always the best approach. Even when it is in our power to solve a problem it is not always in their interests that we do so. Removing a child from a difficult situation is, in many situations, completely appropriate but sometimes not. Trusting that we have the ability to cope with something, even if we don’t have the knowledge at the moment, is very important. In our society knowledge is highly respected. Often it is portrayed that people who don’t know must be ignorant. But we can’t know everything, even The Dali Lama says he doesn’t know. Life is about constant learning. There are times when we just have to go with the flow, trusting in ourselves that we will get to the bottom of it, or it will just naturally change. It can take time to get through the issues children present us with. When we keep ourselves open to the possibilities and searching then we often find the answer, or part of it, comes from unexpected areas. I hope these tips are helpful. If you find your child has a certain emotion causing issues over and over again, like worry or anger, then I can happily recommend a series of books some of which I have used. It is great to have something structured to work through slowly with a child. For younger children who worry a lot there is also a great book called ‘The Huge Bag of Worries’ by Virginia Ironside and ‘TA for Tots’ by Alvyn M Freed, which takes a look at emotions and helping give younger kids a way to talk about what is happening for them. Thanks for reading. I would love to know your thoughts, experiences and feelings about the challenges children pose. I reply to every comment. Next > Why it is great to see other parents struggling! Hi Sarah, Smacking is a tough one and we have all been there. We see children hitting others and it is easy to ‘My child wont do that’ but of course at a certain age they do. They are testing it out and seeing if it works. Over time they discover that it doesn’t. It is important to remember that all children try most things at some time, it is just about helping them decide what to carry on with and what not to. She will get there. Both my boys did it and it passes. Keep reinforcing that you don’t like it. Sometimes if it is through anger finding something else they can hit transfers it to a better place. ‘Hit the sofa if you are mad’. Thanks for commenting. Remember you are no different from any other parent and she is in the process of learning. Hi Chantelle. Yes patience is something we need in bucket loads with children. I am glad you found it useful. Thanks for commenting. Baby Isabella recently posted…I can’t sleep! Glad it was useful. It is not easy when there are sleep problems. Thanks for commenting. Beth recently posted…Work With Me. Hi Beth. I am glad it was interesting. Thank you for commenting an hosting your linky. These are really helpful tips. As human beings we are not perfect and neither can we always have the answers to knowing what is best to do. Opening into knowing and accepting this is key. Lets have a be kind to and give ourselves a break week! Hi Sandra. That sounds good to me. We would all benefit from more self kindness. Great to have you return to The Guilt Free Guide. Thanks for commenting. Hi Zena. This is always a tough stage to go through but we do all go through it. You are not alone. It seems like you have a new plan (the ignore approach). Hang in there and see how it goes. If that doesn’t work something else will. she wont carry on indefinitely, not if she has parents who keep exploring what to do. One of my sons had to be redirected to hit something else first before he could move onto no hitting. Good luck and thanks for commenting. Great advice. There is no perfect parenting but tips on how to be a better one are always so helpful. Thanks for the book recommendations as well and for linking up with me at #momsterslink. Hi Trista, I do think that is the problem with a lot of parenting advice. It focuses on a way to do something rather than the experience of the parent and child. thanks for commenting and hosting. Helen Porter recently posted…Whats In my changing bag? I so agree, parenting is tricky. It is worth really thinking about what is going on for your boys. What are they feeling? What motivates them or doesn’t motivate them? There are no easy answers. Best of luck with them. You do have the skills and some day you will look back and know that you sorted the problem. Thanks for commenting. It is much appreciated. Mrs Tubbs recently posted…Liebster Award. Passing It On. Perspective is important although not always easy to maintain when challenged. Thank you for your kind words and leaving a comment. It is much appreciated. Hi Emma, You have already got to emotion behind the behaviour which is great, she wants attention. Well done. Looking at the emotion behind a behaviour is valuable and for much more than toddlers. Thank you for your kind words and commenting. Have a great weekend. Hi Victoria. I am glad you singled that one out. It is so easy to feel like we have to fix things for our children but they are on a learning curve just as we are and they will learn. I so agree, trusting them is very important. It can stop us undermining them or giving them the idea that they cant manage/are getting things wrong. Thanks for your insightful comment. Glad it helped. Hang in there Talya. It is not easy bit one thing guaranteed is change. Thanks for commenting. I think #1 is the most important, not only with children, but in dealing with anybody. The only way to try and figure out why somebody is acting a certain way to to understand their motivations. Hi Jeremy, You are so right. The same issue can have many emotions fuelling them and so would need to be treated differently. It is a challenge however to decipher what lies behind the issues. Thanks for commenting. Really helpful tips Kirsten, will definitely be thinking of them throughout our days. We have a huge problem with listening. It’s an issue in school too. Hopefully we combat it over the summer and have a fresh start come September!! Good luck Kellie. We need to look at our children’s temperament as a whole and appreciate their challenging sides are often the flip side of their strengths. Finding ways that help is not always easy. Maybe listening games to make it fun and not personal. Glad you found it useful. This is interesting, thank you for the tips. I love your posts! They are always full of useful advice and written in a non-judgemental way. I like tip one – treat the cause instead of the symptom. Thank you very much Debbie. Treating the cause as you so rightly put it is generally better in all walks of life. Have a great week. It is tough to be okay with ourselves in those times. We want what is best for our children but cant work out what to do to help them. Holding steady, trusting them and being kind to ourselves is pretty important. We have all been there. Thanks so much for your comment. It is much appreciated. Great tips! Our issue at the moment is biting. Trying to read up on it and be consistent. It’s tough to keep your cool when it’s frustrating and painful! You make a really good point. As we get frustrated it is tough to keep cool, especially when it hurts. I don’t think there is any point in kids seeing that something they have done has caused us pain. Very young children bite because they are experimenting. It was a shock when I first got bitten but I could see there was no malice in it just testing it out at an age when everything goes in the mouth. Older children who know it is not good bite do it for other reasons. Best of luck with it. You will get there and it will become a distant memory at some point. Thanks for commenting. You amaze me every week and I am honoured that you have been linking up with me at reflectionsfromme.com! All mums should follow your blog, you make so much sense. Mackenzie Glanville (reflectionsfromme.com) recently posted…Tears, nerves, freedom and pride! Hi Mackenzie. That is a wonderful comment to click into. Thank you and it has come on a day when I really need it too. Your support is really appreciated. Hi Jen, It is a difficult concept to put over so I am glad it made sense to you. We all have our fears and we are better for acknowledging them so we can parent our children from a more balanced place. you are so right, none of it is easy to put into practice. It is a constant learning process for all of us. Thanks very much for commenting. I think your advice to keep searching and not give up is one of the most important. We as parents have to keep trying different things to see what works and what doesn’t. Hi Lisa. It is never easy as human beings are complex. Making sure that everyone is taking the same approach is a great thing to do. It means that he will get a clear message. As I said in the post things that are driven by an underlying feeling don’t go away over night. It is great that you can identify frustration and attention as key feelings. All children search for attention and we can just attempt to channel it. I sounds like the frustration might be key here. When you work with the underlying feeling, like frustration, you are helping him in so many ways more than just the behaviour of throwing things. Best of luck with it. Thanks for commenting. That is great Rebecca. I am really glad you do that. It is very important that our children know that it is the behaviour we don’t like. From quite early they can tell the difference between ‘That’s naughty’ and ‘You’re naughty’. What a difference that can make to how a child feels about themselves. Thanks for adding to this conversation. It is much appreciated. Hi Hannah. It is tough when our babies cry a lot. It undermines our confidence in our ability as a mother. When we have babies who we can soothe it is easy to build up confidence. But actually by being their for our distressed baby we are doing a great job anyway. I am glad you have found a strategy that works for you. Thanks very much for commenting. Hi Karen. For older children this is really key and it is the most important one for me and my eldest son too. They really pick up on how we feel about them. When we worry and problem solve they can get the impression that we don’t believe they can cope. It is hard to step back particularly when they have challenges but sometimes it is the best thing to do. They discover their own resources and grow in confidence. Best of luck with your eldest moving onto the next school. Thanks for commenting. Hi Michelle. Sleep issues are so difficult and of course there can be a whole host of reasons behind them. Some children don’t need a lot of sleep, for others it becomes a game of getting more attention and others might find it tough for different reasons. Can you identify what is going on for him emotionally? From what you have said it is more than a child who doesn’t need a lot otherwise he would not be so tired. My heart goes out to you. We have been there with one son and it is not easy. Hi Sarah-Jane, Thanks for your comment. It is tough when they are not listening. It makes me wonder if he is in need of something or annoyed at something. Often when they are old enough it is worth talking to them about it at a time when they are not being difficult and you are not annoyed. All children try out different behaviours to see if it works of course.I wish you best of luck with it and and glad the tips were useful. Thank you Orana for your kind words. Don’t forget that some things are just a learning process. Little ones need to have things repeated over and over until they get it.Their learning doesn’t always happen in the logical order that we might expect. It is really frustrating and anyone with a young child has been there. Be kind to your self and hang in there. It will change, that is certain. Thanks for commenting. Very interesting suggestions you have shared. I don’t know whioch is my favorite because I find them quite helpful. Trying out what what for each indidvidual child is true. No one child acts the same or have the same needs as the other. Individuality is wisdom. Thank you for the post Kristen. Hi Ifeoma. You are so right. Each child is different and needs to be respected as such. It has amazed me how different my children are and therefore how differently they respond. There is no one size fits all is there? Hi Melinda. I am really pleased to hear that. I thing that trusting our kids is very important. In that way we don’t undermine them and we learn to respect their journey through life. when we trust our kids they learn to trust themselves which is a great gift. Thanks for commenting and giving your continued support. Such great wisdom and insight! There is so much truth in this post! Thank you for your kind words. It is much appreciated. Hannah Mums’ Days recently posted…Accountability and the #MDFitClub Buddy! Hi Hannah. Firstly thank you for your lovely and supportive comments. You have really made my day. Secondly I am so pleased that you have those insights into the situation with your son. Kids pick up on the emotion of a situation. Changing that can help them change. I had a slightly different scenario but it was problems with my son at meal times. Once I twigged that there was stress around meal times I started countering it by playing games and doing songs etc. It slowly altered the situation until dinner was transformed. All the issues didn’t go but most did and it all calmed down. What a relief. Hang in there. See what a change of tack from you brings about. Thanks for commenting. It is so easy. Your comment is really appreciated. Thanks. Tell me the truth now… you’ve been spying on me and KNEW I needed this post. We are having such challenging times with my almost 4-year-old. She screams (like really screams at everyone including her sister). I can cope with a lot but that scream is enough to send me into a spiralling funk. It feels like we’ve exhausted every possible solution but this has given me the encouragement to observe and reflect on the situation a little better. I am so glad that it has been of use to you. It is genuinely very tough to deal with these repeated issues. It is so hard to know what goes on in their minds and at that age they don’t have the words to tell us. I think observing and reflecting is a great idea. Watch and wonder what is happening for her to react in such a powerful way. What does she feel is not being heard? Best of luck Jennifer. Thanks for commenting. A great weekend to you too. This is such great advice! I love what you say about being okay with not always knowing the answer… definitely something I could work on. Thanks for linking up at the Manic Mondays blog hop! Hi Meredith. It is genuinely hard to sit with things that are difficult and trust. We all want to fix things straight away. But sometimes it is what we need to do. Glad you found it useful. thanks for your kind words and commenting. Great tips. Sorry the comment for last weeks #BinkyLinky is a little late, we were on holiday and only got back late last night! Hi Emily. I hope you had a great holiday. It is great to get away and have a change of scene. Thanks for commenting. This is a great realisation. Be kind to yourself with this knowledge. Many of us have difficulties with asking for help. We are taught to be independent and it is highly prized in our society.Of course no one is a failure in asking fro help. Parenting is not a role that we can do alone. We cant do and be everything for our children. I sounds like you have a way forward in being able to seek other input. You don’t have to take it but even when we don’t agree sometimes that adds clarity too. Debs @ Super Busy Mum recently posted…Ed’s Easy Diner, Belfast: My first restaurant review! Thanks Debs for your comment and hosting. It is a great thing to remember. no one has all the answers and some things cant be fixed as they are part of the learning process of life. Great post. Needed that reminder. Thanks for sharing. I am glad this was of use Miep. It is good to have reminder of the things we already know. thanks for commenting and your continued support of the Guilt Free Guide. It is much appreciated.